NOTE: This free IQ Test game has stopped working. It no longer shows your score at the end. I am working on a solution for this. In the meantime, you might enjoy the free online memory games on this site. unofficial measure of your intelligence quotient (IQ). The test takes 20 minutes to complete. To begin, click the Small, Medium, or Large link under the picture at left. This opens the IQ test in a pop-up window. While this IQ exam is supposedly based on the real Stanford-Binet intelligence test, it is not an official intelligence exam. This is more of an IQ test "practice exam" than anything you would put on your MENSA application. But it may give you a general idea of where you fall on the scale of intelligence. Note: This exam includes only non-verbal questions. In that sense, the test is not culture specific. The instructions display in both English and Chinese. This doesn't affect the test. Just ignore whichever language you can't read. When I took this test, the questions really seemed to be authentic IQ questions you might find on an official IQ test. So this might actually be good practice for the non-verbal section of the real thing. From what I could determine, you don't get the exact same 30 questions every time you take the test. Questions that do get repeated seem to be shuffled each time as well. Since the exam is slightly different each time, I suppose you could take the test more than once if you felt your initial performance was subpar. HOW TO TAKE THE TEST. After the test loads and the advertisement ends, the main menu screen appears. 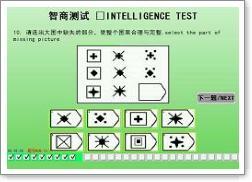 The message on this screen indicates the IQ test is intended for children over 11 years of age as well as adults. Click the PLAY button to begin the exam. You have 20 minutes to complete this free IQ test online exam. A small countdown timer displays in the lower left corner of the test. Keep an eye on the timer. To get a true score, you need to answer all 30 questions before the timer runs out. To answer a question, first decide which of the six possible answers shown at the bottom of the test is correct, based on the information displayed at the top. Click that answer once to highlight it, then click the NEXT button to go to the next question. To the right of the countdown timer is the "question count" display. This shows which question number you are currently working on (for example, 27/30). As you answer each IQ question, a check mark appears in one of the tick boxes at the bottom of the exam. The tick boxes are another way for you to quickly determine whether you are maintaining an adequate pace to finish on time. When you complete the test, a "Finish" window appears. To see your IQ score, click the orange Show Score button on this window. Let me emphasize again that this is not an official intelligence test. Don't be discouraged if you score lower on this exam than you expected. Only a real IQ test administered by a qualified professional is worth taking seriously. I've heard that a few super-geniuses in the world score over 200 on IQ tests. Well, if you are one of those people, don't bother taking this free IQ test online exam. 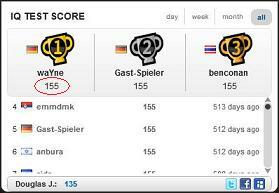 The highest score I've seen on the leaderboard is 155 (see image above). This practice IQ test is apparently not designed to accommodate the exceptionally brilliant among us. Game distributed by MochiMedia.com. Used with Permission.